Samuel Medina has been writing for most of his life, but Katarina the Dragonslayer and the Foebreaker’s Curse is his first full-length novel. It is an epic fantasy with a sci-fi twist, the first in The Fetters of Wizardry series. The book is written for a general audience, although it is gaining popularity among the YA crowd. Many are anxiously awaiting the next book in the series, Katarina the Dragonslayer and the Secret of Kilara’s Keep. Target Audience: General, though the YA crowd seems to like it so far, too. Living in a world scarred by an ancient conflict between magic and technology, a half-elven slave girl dreams of freedom and adventure. When she finds a pair of magical swords in a cave, she sets off a confluence of events that will change the course of history, much to the dismay of dark forces from another world who have been manipulating events to keep control of the planet’s source of magic. The book features a blend of magic and science, elves based on Native Americans, an ogre artificer, a literally mad scientist and some very saucy dragons who can’t help meddling in the affairs of the “lesser peoples”. Katarina the Dragonslayer and the Foebreaker’s Curse is a tale of fantasy adventure with a steampunk twist, set in a world scarred by an ancient conflict between magic and technology. It includes elves based on aboriginal peoples, a small girl with great power, a literally mad scientist, and saucy, meddling dragons. Yes, but I think it’s best for them to see it for themselves. The last thing I’d want is to steer someone’s interpretation of my work. 3. If Oprah invited you onto her show to talk about Katarina the Dragonslayer and the Foebreaker’s Curse, what would the theme of the show be? Building a new mythology through fantasy and science fiction. 5. How did you get the idea for Katarina the Dragonslayer and the Foebreaker’s Curse ? Long story! I was writing what will now be Book 5 of the series when I came to an impasse. At first, I was going to go about 15 years back to the events that led to the Elves regaining control of Eastern Melloren, but there were still some gaps – questions in need of answering. I needed more history for the world, and one character in particular needed an origin, so I backtracked 80 years or so in the world’s history to when Katarina was 11 years old, and then I tried to figure out how she came to be known as “the Dragonslayer”. 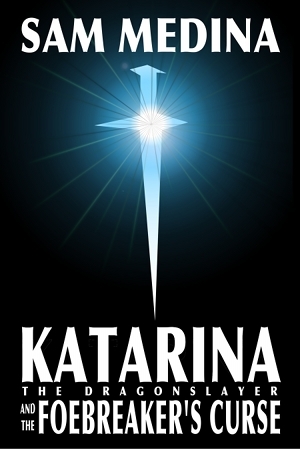 Katarina, plucky little thing that she is, hijacked the storyline and literally changed the course of the series’ history. The novel, sort of. It was intended to be a short story with the working title of “Dragonslayer”, but as events unfolded and it started looking like a book, I knew the title would need to change. Then, in Chapter 8, something happened that changed everything, and that gave rise to the final title. It’s hard to say, since as a writer I always have that feeling of being a hack – even Tolkien thought LOTR was destined for wastebaskets everywhere, never to be remembered – but, if I had to pick one passage, I’d say the opening to Chapter 5. Readers have spoken of framing that opening and putting it on their wall because of how it caused them to want to be in the story… and that’s a great feeling. Hmm… I don’t know. I went through about a dozen rewrites, so it’s hard to say. Perhaps the character known as Nasmi would get more “screen time”. Originally? That fateful day in 3rd grade when I was looking through the science fiction section at the school library and saw two words that caused me to know I’d be a writer: THE HOBBIT. With Katarina, in particular, it was the need to have a starting point to the events that bring the conflict between magic and technology to a new boiling point, so to speak. Something had to set it off, and as it turns out, Katarina’s curiosity was just the thing to get it going. Writing characters is like riding a horse. If you’re too tight on the reins, you’ll never know what he can do. Sometimes you have to let him have his head, so to speak, and let him run as hard as he can so you can really know him… or her. 12. What genre have you not yet written, but really want to try? I haven’t written any hard sci-fi… I’m very tempted to do so when I finish The Fetters of Wizardry. I have one idea on the back burner that may very well be a game-changer. I’m reading Freedom of the Monsoon by Malika Ghandi, a tale set during India’s struggle for freedom. Right now, I’m working on Katarina the Dragonslayer and the Secret of Kilara’s Keep. In this book, we’ll get deeper into the details of the world’s history – the particulars of the conflict between magic and technology – and we’ll get to watch Katarina start to grow up, as it takes place about a year after the events in Foebreaker’s Curse. Yes. Write all the time. Watch and listen to people. Read a lot. Most of all …LIVE. The greatest writers also had lives, whether it was Hemingway and his roughriding adventures, Mark Twain rolling down the Mississippi River, or Tolkien and his academic career.